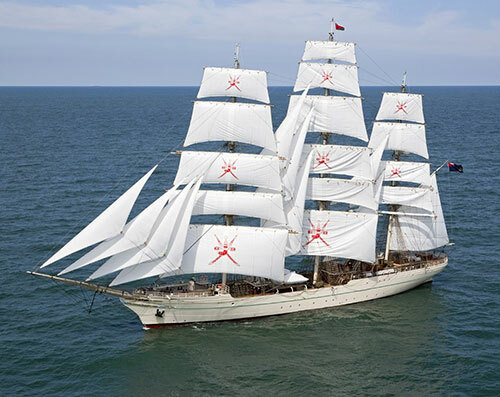 In response to the royal directives of His Majesty Sultan Qaboos Bin Said, the Supreme Commander of the Royal Armed Forces of Oman, the RNOV “Shabab Oman II” left the Sultanate Monday on her 4th international Journey “Masts of Glory and Peace”. Sayyid Badr bin Hamad bin Hamoud al-Busaidi, Secretary-General of the Foreign Ministry presided over the farewell ceremony for the vessel at Said Bin Sultan Naval Base. During her six-month journey, the vessel will visit several European countries to take part in the long sailboat regattas and participate in several festivals and celebrations. The Shabab Oman vessel seeks to deliver its mission of extending bridges of friendship and brotherhood between the Sultanate and the world through highlighting the authentic Omani culture in its various international stations. The Royal Navy of Oman (RNO) Command organized Sunday an open meeting to inform the media about the national missions of the 4th International Journey of the RNOV “Shabab Oman II” themed “Masts of Glory and Peace” and to learn about its various facilities and its leading role in highlighting values of the Omani civilization and the glorious history of the Omani people. Captain Ali bin Mohammed al-Hosani, Commander of the RNOV “Shabab Oman II” presented in the meeting a brief explanation of the vessel. He pointed out that the current ship came to replace the Shabab Oman I, which came in response to the vision of His Majesty Sultan Qaboos Bin Said on the importance of cultural and civilized communication between the Sultanate and various countries of the world. He explained that the journeys of Shabab Oman Vessel aim at building bridges of friendship and peace among various peoples around the world and to promote the Sultanate's tourism and culture, as well as to train young people on sailing, refining their abilities and fueling the spirit of competition and adventure among them. Captain al-Hosani reviewed the journeys made by the first and second Shabab Oman Vessels. The two vessels have won the International Friendship Cup for ten times. Such award is considered the distinguished sailing one. In another development, Rear Admiral Abdullah bin Khamis al-Ra’eesi, Commander of the Royal Navy of Oman (RNO) received in his office Sunday Colonel Mubarak Ali al-Sabah, Commander of the Combined Task Force (CTF152) at the Kingdom of Bahrain.